There's nothing like live music in the park on a warm summer's night. 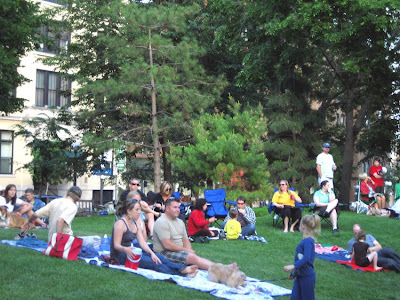 Especially when the music is free and the park is beautiful Mears Park in downtown St Paul. 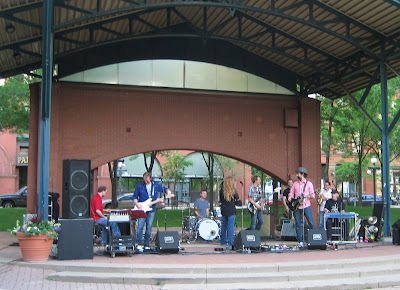 Every Thursday during the summer, from 6 to 9pm, June through August, the Music in Mears organizers bring us a free concert in the heart of downtown. Featuring great local bands, such as Hookers and Blow and The Hopefuls, the concerts bring the community together for some good old fashioned fun. Each week a different local restaurant offers up some yummy food and drink to keep the party going. In addition to the live bands, Music in Mears also features six weeks of full length movies beginning the end of July. This year the movies kick off on July 23, with The School of Rock. You can find the full schedule of music and movies on their website. When you come, bring a lawn chair or blanket to make yourself more comfortable. 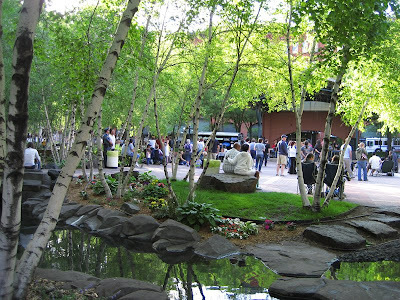 Mears Park is a beautiful setting to relax with some great music, movies and people watching! Stephanie Troutner has a cute little shop on Etsy where she sells her embroidery art and fabric-covered boxes. 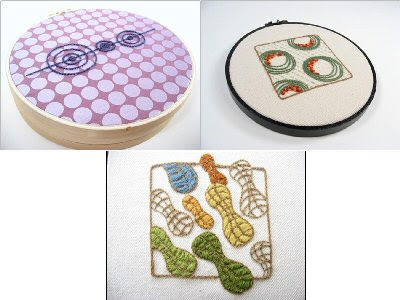 I've always liked the idea of hanging needlework from an embroidery hoop, and these pieces are just that. Stephanie's Stitchings displays a variety of Stephanie's own designs. She has captured a retro feel to her work, with which I'm totally in love. I also think the idea of doing embroidery on patterned fabric is lively and unique. Stephanie's work can also be grouped for an interesting and colorful addition to a blank piece of wall. For one or more great pieces of art that provide wonderful colors and texture, visit Stephanie's Stitchings. Pictured above are: Purple Lollypop Swirls, Jamaican Pearls, and the ever so fun Flying Peanuts. Welcome to Winona, Minnesota home to Stena Lieb and her store, Crazy Busy and her creative upcycled bags, prints, paintings and sculpture. Stena creates her treasures in the basement of her home, but also likes to take her work outdoors to watch her boys play while laundry dries in the sun on warm summer days. When the weather is less than cooperative, she claims the kitchen table as her work space, since working in the basement can get quite cold. “I have slowly been taking over a little bit more of the basement as I can,” Stena says. So far so good -- her husband hasn’t even noticed! Inspiration comes in many forms for Crazy Busy. Pages from magazines that hang from the vents in the basement, trinkets and treasures and art books all help in the creative process. Keeping tidy and organized can be a challenge for Stena. “Because my space is so small, I try not to collect too many random things, but that is a battle I have yet to win.” She would like to have a larger space to paint and sculpt, but at the moment there is no room for her to branch out. Stena even has a little help from her twin sister, who sometimes comes to organize while she works. 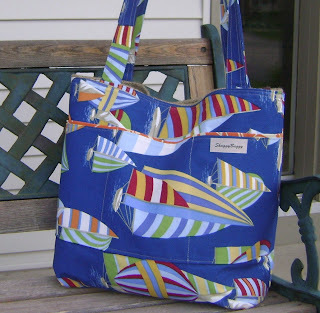 Meet Handmade MN member Sharon Schneider of St. Paul, MN. Sharon is married and the mother of three teenagers. On top of all that she runs her store Shaggy Baggy. You can also find Sharon of her Shaggy Baggy website. I sell totes -- and handbags. 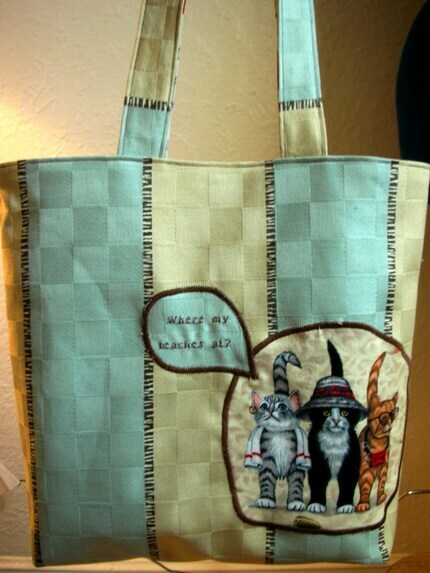 Right now I am focused on recycled coffee totes. I like to repurpose. I am inspired to make items functional yet unique and original. I took every sewing class my high school offered. I've been crafting with my kids for 15 years. I am pretty busy sewing now. We will make an occasional Christmas ornament or gift. Ikea, Ahkwok buckles. On ETSY: Vintagehomestyle, JennifersJewels does my labels, I got a great ironing board cover from CityChicCountryMouse. I stay visible with new listings and renewing often. They say death and taxes are the only sure things in life. Seems kind of cynical, but I don't think we'll see either end anytime soon. Actually, beginning July 1st, the statewide Sales and Use Tax rate will increase to 6.875%. Many communities also have local Sales and Use Tax that would go on top of this new rate, as well as the .25% Transit Improvement Tax for the Metro Area that was put in place Spring, 2008. All these different Sales, Use, Transit and Local Taxes can be confusing when it comes to doing shows. What's the best way to know what you should be collecting? Well the Minnesota Department of Revenue has a way to help. 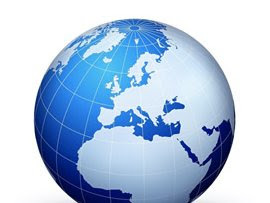 Their website has a very useful tool where you can enter the zip code of show or your home for that matter and it will tell you the correct amount to collect for any size sale. Click here to visit this Sales Tax Rate Calculator. It's just one way our State is helping to make paying taxes easier for us. Thoughtful huh? Pure genius: Up-cycled, Re-cycled, "Green" - Creating your own beautiful hand-made paper?! Do you accumulate tons of junk mail every day, week, month? Wouldn't it be great to transform your 'tons' of garbage paper to a new and usable, artsy/crafty form right in your home? 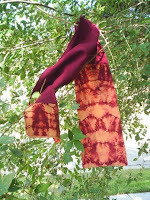 Many people are going "green" these days, and are using their creative energy to do just that! The concept......Handmade Paper (making)! There are many uses for handmade papers: invitations, one-of-a-kind note cards, sending a hand written letter on personal stationary, scrapbook paper, even putting it behind glass/frame and hanging it on your wall! The key to success you ask: Quality of the paper used to form the pulp. You want to ensure a nice, lustrous finish as an end product. Newspaper is a no-no, the chemicals in newspaper and the ink form a foamy sludge in the creation process and results in a muddy looking sheet with poor quality. For best results, combine a recycled base with equal amounts of abaca or cotton pulp. This can be purchased in semi-processed form for use in your own blender! Michelle Bierman is a creator of handmade paper, and is currently building her website (coming soon) : www.michelleshandmadepaper.com, and is from Minnesota. I had a chance to do an email interview with her about the process of paper making, what she creates and how she got started in this creative art form. Why make your own creative handmade paper? MB: I actually make a unique paper that many companies use to create awards for their employees. In other words, instead of a certificate or plaque, we will emboss a company logo or silk screen handmade paper. What type of fibers/materials do you use for paper making? 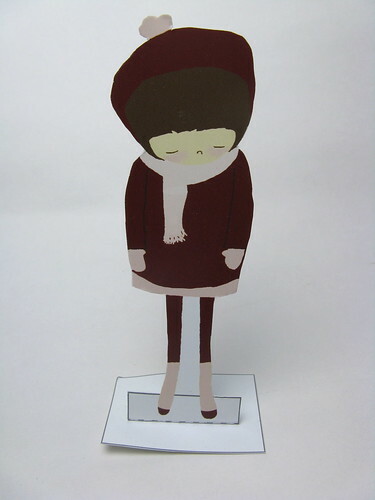 MB: Mostly Cotton, but for my own paper projects, I use a variety of materials. Where do you get these fibers or where do you buy them? MB: I order recycled cotton from a papermaking company. If I am making paper for a project, I have used paper, construction paper, napkins, newspaper, and even turned my students' homework into paper. What type of mold do you use? What is it made of? MB: Many type of molds. I use screens, silicon, plastic, and for embossing metal plates. After you've pressed the paper layers together, what is the next step? MB: I dry it, and roll it in a press for embossing. After the paper is dried, is that it or is there more? 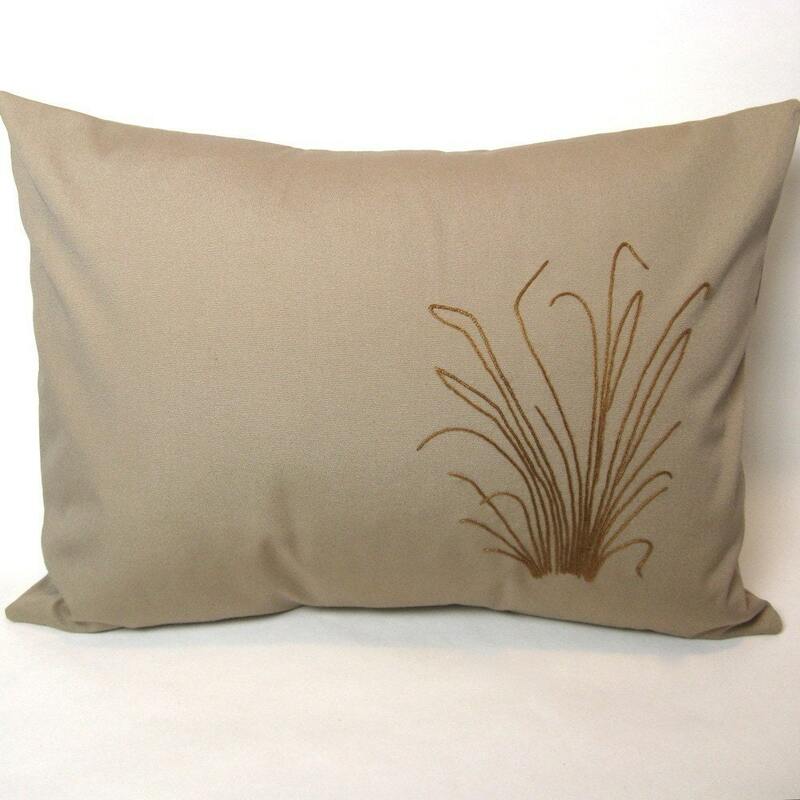 MB: I often emboss it, silk screen, or even paint on it. What do you do with your handmade paper? MB: Projects, and then most of my business is corporate awards. What type/kind of artist do you like to be called/considered? Do you sell your paper or crafts made from the paper? MB: Sometimes, but most of my projects are wholesale use. Any tips/techniques you can provide for trials/errors you've learned from, let us know. MB: Just play around. There are many techniques you can use. And, take a paper class. They can be lots of fun! Like Michelle says, it can be lots of fun to experiment with making beautiful hand-made paper. Try it sometime, you might get hooked! For questions, you can reach Michelle by email: michellebierman@gmail.com. Whether a person creates a sewn bag, a knit top or a crocheted creation, crocheted edgings can put a nice finishing touch on a garment. Below are a few simple edgings. These are simple ones taken from "Crocheting Edgings" edited Rita Weiss. Three that I have taken from the book are: periwinkle, arabis and primrose. 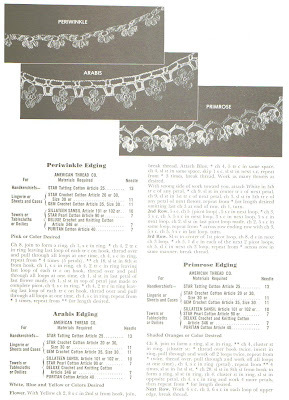 Many times edgings were used on linens to dress them up such as handkerchiefs, lingerie, sheets and pillow cases or towels and tablecloths and of course, doilies. I know that my grandmother would dress up a set of pillow cases or a handkerchief. It’s finally spring. When I think of spring I think of baby chicks, baby bunnies, and baby…humans! 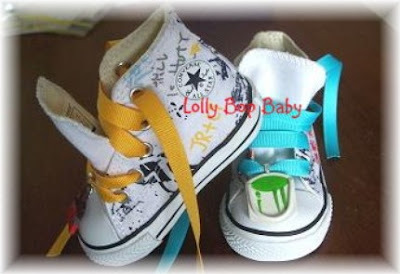 At LollyBopBaby you can find all sorts of really cute accessories for your little spring bundle of joy. The little stroller and/or baby carrier covers look so cozy and soft. They’re crocheted and best of all machine washable. This one is a beautiful snow white color. 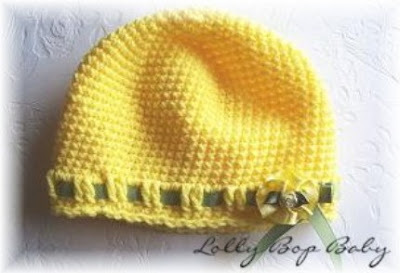 Those little fuzzy baby heads need some warmth from time to time, and LollyBopBaby offers the most darling beanie caps with very stylish embellishments. This one is a sunny yellow with a pretty green ribbon. How adorable! 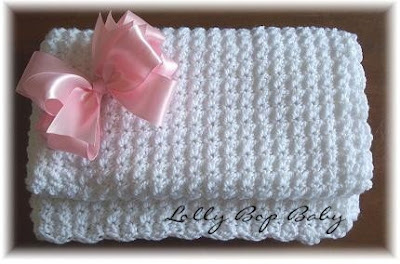 If you're looking for accessories for your little springtime blessing, check out LollyBopBaby. Everything is lovingly handmade, and what could be better than that? And now onto Part II...the setup! 4. What do you do to prepare for a craft show? We find that what really helps when preparing for a craft show is organization. I like to organize my merchandise by how they will be displayed and bag them accordingly. I also make sure I have plenty of drinking water and cold beverages, snacks, and layer my clothing to prepare for possible weather issues such as heat or rain. All of our displays are in large plastic tubs, we use colorful table cloths and scarves to dress up our displays, and we make sure to use layering and steps to add variety. Be sure to have hand mirrors if your items need to be tried on. We also make sure we have everything packed the night before the event and in the vehicle so we had minimal work in the early morning hours. It also helps to set things up in advance if you can, like in your basement or yard, so you have an idea of how you would like things to look. 5. Do you have any tips for first timers? Don't be afraid to get out there and represent yourself professionally. 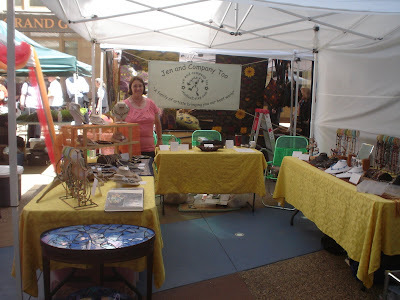 Get to know other vendors, most artists are friendly and will give you helpful advice if you ask. Remember that shows are sometimes a risk and you may not make a ton of money every time. Some shows are great for networking even if you don't sell a lot and you might find out about other shows and places to sell, so take every opportunity that you can. Make sure to have stacks of business cards on the end of your tables. If your booth is full of customers, some people might grab a business card on the way by and stop back later. You don't have to spend a ton of money on displays. Your local Goodwill or Salvation Army can sometimes have great displays if you have some imagination. Use color, but try not to drown out your items. Get your name out there and revel in every sale and compliment you receive, no matter how small it may seem. Make eye contact and say hello to potential customers as often as possible and be friendly. 6. Describe your setup. How do you make your booth customer friendly? What kind of displays do you use? Do you decorate your tent? 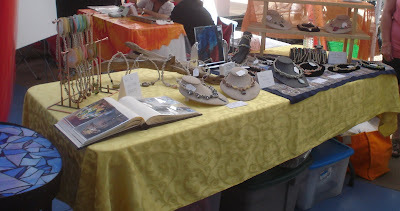 To make our booth customer friendly, we try not to sit in front of our items as often as possible. Sometimes, space is limited, but we like our booth to be as open as possible when we can. We offer gift bags, receipts, business cards, and accept Visa, Mastercard, and personal checks with valid I.D. Having the ability to do custom orders and create on the spot items is something I would recommend. 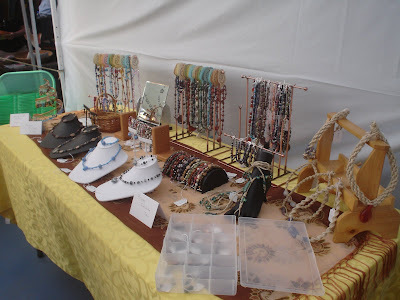 It was especially helpful for the TOF market, as there are many business professionals as well as people visiting from other countries that fill the plaza, so if customers can see you making items, it adds interest and an aspect of availability that they might not get anywhere else. People really love one of a kind creations made just for them! 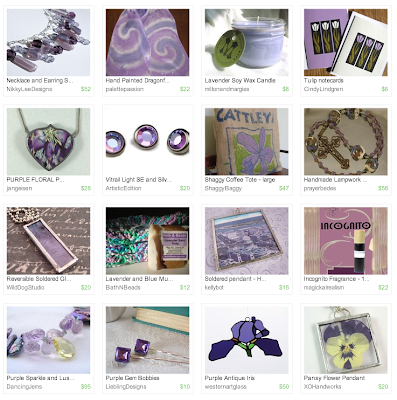 Congratulations to Sarah of Retro Vertigo for winning May's HandmadeMN monthly challenge! Thanks to all who participated in this month's challenge, and stay tuned for some great "Turquoise" entries in the June challenge! Check out these great, one-of-a-kind, walking sticks on Etsy's Bearpawrustics shop--a favorite of Minnesota etsian, starsaponthars's. I think they would make a great Fathers Day gift for the avid walker, or one who needs a little encouragement! For national maps, Trails.com is a wonderful resource. Joining a non-competitive Twin Cities' Volksmarch is another great way to get out and walk with others. In German, "volksmarch" means "a people's" walk. There are Volkssporting clubs located throughout the U.S.. The American Volkssport Association, founded in 1976, is a educational non-profit corporation dedicated to promoting non-competitive physical fitness, friendship, and fun through volkssporting events. Meet Katherine Arcand. Katherine lives in Minneapolis with her cat Dagny. When she's not busy making things for her store she's an Administrative Assistant at Children's Cancer Research Fund, a local non-profit. 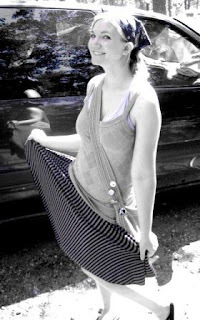 You can find Katherine at her Etsy store, The Musical Kitten and her blog also known as The Musical Kitten. 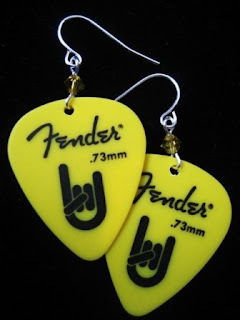 I sell jewelry made from guitar picks. I try to play to both genders as much as possible. I’m working on some accessories, too. So far I’ve got a belt and book marks! I joke that my design for the “fancy” style of necklaces in my store came to me in a dream, but it really did. 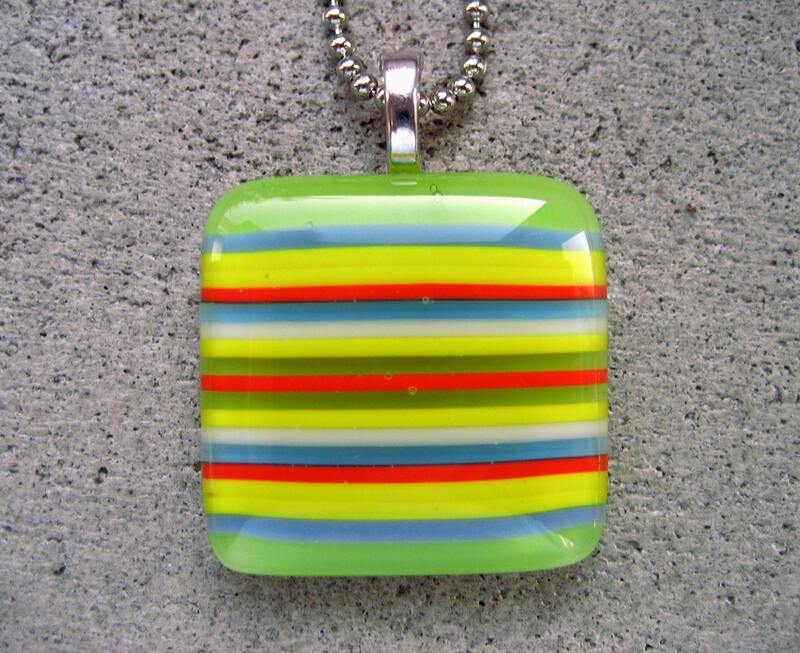 I dreamed I had this awesome necklace and woke up thinking “I bet you I could make that…” sure enough, I went to a supply store and made 6 that day. I still have the original. Other than that, I am constantly looking at jewelry at stores and trying to figure out ways to make similar items, but affordable ones for the indie kids I know. I’ve been crafting since I was in elementary school. I’ve always liked to know how things are made and DiY was a favorite pastime for me. Of course, as I got older the crafts got more complex. 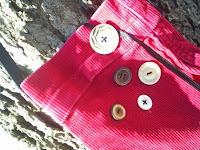 Safety pin brooches turned into hand knit scarves, but I’ve always been making SOMETHING. Goodness yes. 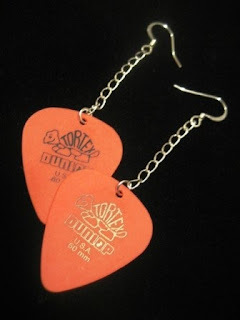 I scrapbook, knit, crochet, make replications of jewelry (for friends who have that one pesky earring go missing) etc. I also write and play guitar (both things I consider art!) when I have time. Etsy typically has everything I need. If I need to pick up something quicker than shipping allows, I head to Michael’s or Bobby Bead. For my picks, it’s a lot of sleuthing on eBay and internet searching. 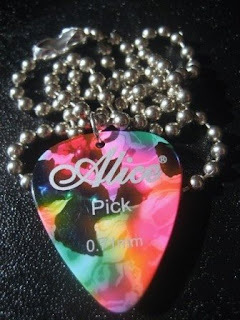 I like to try to find picks I don’t see used anywhere else. In all honesty, I haven’t done much. I really should, but I’m kind of in the dark on this one. The best thing I think I did was buying business card sized magnets and attaching my card to those to send off with purchases. That way my business card is functional and is on the fridge as a reminder! Also, I send a business card inside every book I mail from PaperBackSwap.com just for posterity! The “2nd Annual Yart Sale” will be held from Wednesday June 10th-Sunday June 14th, 2009. 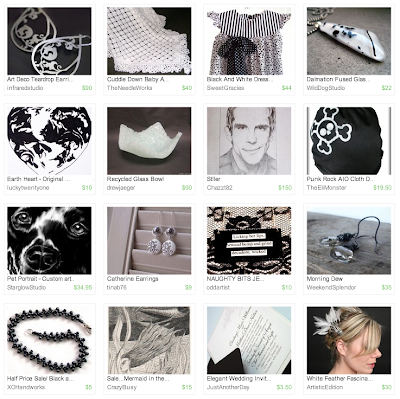 This year the “2nd Annual Yart Sale” will be sponsored by the Etsy Supply Street Team (Team ESST). A “Yart Sale” is an artistic spin on the traditional Yard Sale: Art + Yard Sale = “Yart Sale”. 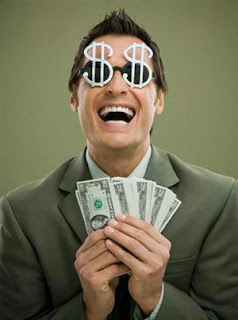 There are many art museums, artists, and groups that have Yart sales annually to raise cash. 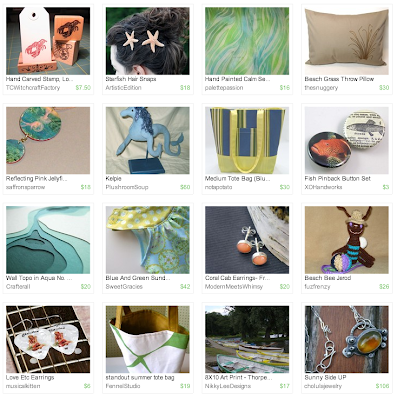 If you are a seller on Etsy please check out the Etsy Storque article for details! If you are a buyer on Etsy please check back here for the promotional thread that will be posted here beginning Wednesday June 10th! 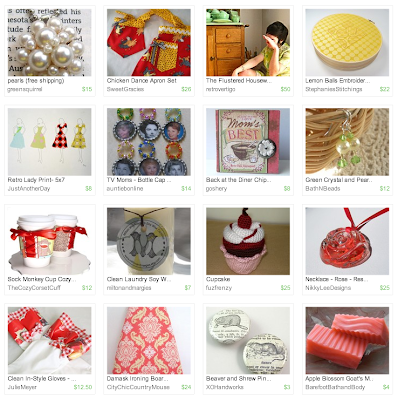 The following HandmadeMN team members are participating in the "2nd Annual Yart Sale". Plese feel free to check them out! - Will be offering FREE Shipping. Code: YartFreeShip (Code must be in "Notes to Seller" to receive free shipping). Will refund shipping via PayPal! - Will be offering 5 FREE Swarovski Crystal Hair Snaps with the purchase of every Feather Fascinator (no code needed)! 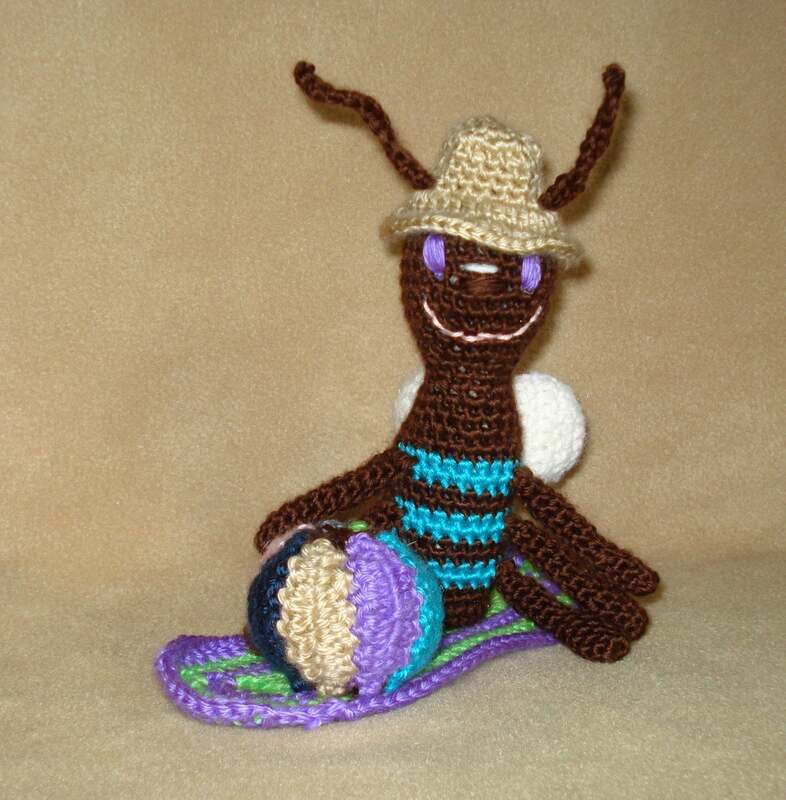 - Will be offering $5 off selected amigurumi plush! - Will be offering free shipping to all US buyers who spend $15 or more, and HALF OFF shipping for all international buyers with a $15 or more purchase. Free Gift with all purchases! 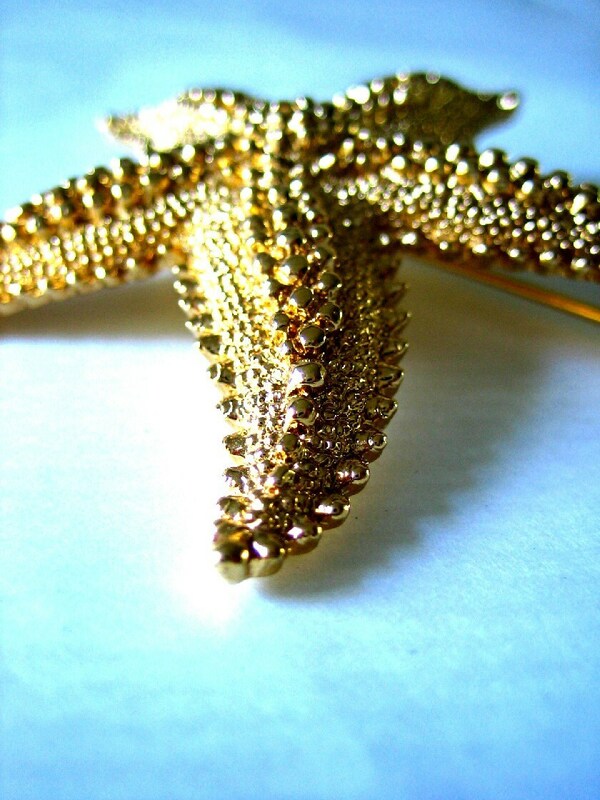 - Will be offering 50% off all beaded jewelry! - Will be offering free shipping on all US domestic product orders of $40 + and International product orders of $50 + ! - Will be offering $1 off all headbands! - Will be offering a special Yart Sale Section! - Will be offering free shipping on everything in her shop! - Will be offering all necklaces for $15.00! - Will be offering 50% off our scrapbooking tools! - Will be offering free shipping on all US domestic purchases of $50.00 and more! One of the things I love about buying from Etsy sellers is how personal the transactions can be. You know you are buying an item directly from the person who made it & often packages include hand written thank you notes. One lovely trend I've noticed with the last couple of items I've ordered was the inclusion of a little something extra. It's such a nice treat to find a little gift in with your order & really makes you feel even better about the transaction. 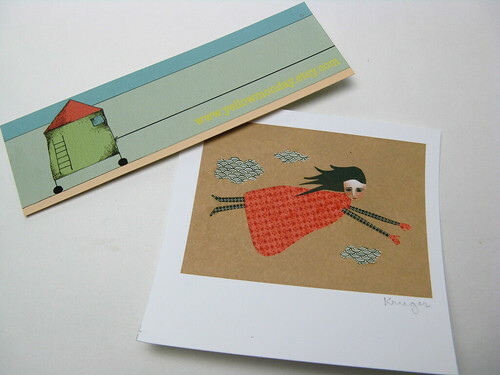 Studio Mela from Minnetonka included this darling paper doll with a print I ordered. I cut her out & she stands in my craft room window. Yellow Monday from Australia included a couple of things in my last order. One was a polaroid-sized signed print & the other a bookmark with her store url on one side & a thank you on the other. Both of these now reside on my inspiration board in my craft room. It's so wonderful to know these sellers put in an extra effort to make your order special. Have you received a little something extra with anything you've ordered lately? Do you include anything with your shipments? How on earth do you keep up with your e-mail? When I sit down at my computer I never know what exciting e-mails are going to be waiting for me! I have to be very diligent when it comes to my organization of my e-mails. I am very methodical when it comes to keeping up with my e-mails and I hope these tips are helpful to you! 1)I check my e-mails every day (sometimes several times a day) and I read, take action, save or delete them every day. 2)I try very hard to keep one e-mail per topic in my 'in box'-all the rest are saved. 3)My file folders are very specific. Not everyone finds this method best for them. However, for me it is so much faster for me to go to a specific file where I can pull the information up quickly. 4)Once a month I evaluate the e-mail subscription lists I am on. If all I do is delete their updates I e-mail them and make sure I am taken off their list. 5)Every day before I turn off my computer for the day I do one quick run through of my inbox to make sure I have read, taken action, saved or deleted my daily e-mails. Do you have helpful tips on how on earth you keep up with your e-mails? Please feel free to share your ideas here! Sharon Schneider is a sewer. 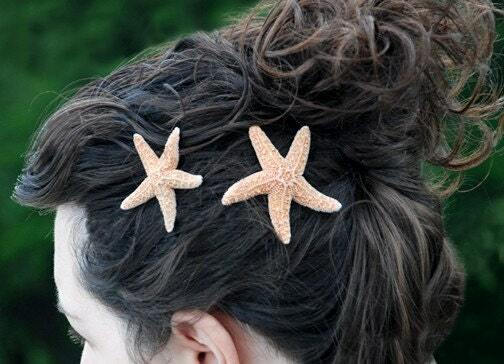 Is that kind of like Sally sells sea shells at the sea shore? No matter, Sharon's bags are much more useful than sea shells and are just as beautiful. 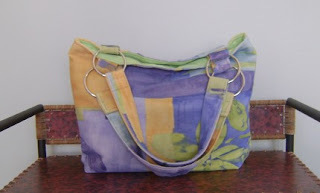 The bags found at Shaggy Baggy come in a variety of sizes and styles. 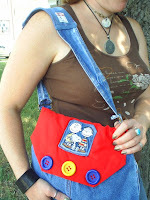 Shaggy Shoulderbag - It's reversible! I really like the coffee tote bags. They're made from real burlap coffee sacks. The designs on these are just fabulous. The interior is made of heavy outdoor cotton. 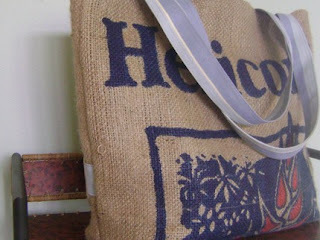 Burlap is sturdy, making these not only funky and cool, but also durable. They're colorful and unique. They're shaggy and they're baggy. Fall in love with the bags in this shop. Buy one for a friend. Have a friend buy one for you. Buy your own. These bags make their owners look really cool, so give it some serious thought. Check out Shaggy Baggy. I think I'll add one of these gems to my birthday wish list! I am usually very environmentally conscious, but, because cleaning is NOT one of my favorite things to do, I am guilty of using products that make it easier. One of these products is the disposable pad floor mop known as the Swiffer. Etsy seller, Country Kiddies, knits these great reusable pads that can be attached to the Swiffer or similar kinds of floor mops. For only eleven bucks, shipping included, you can order, not one, but two of these environmentally conscious and economical covers. 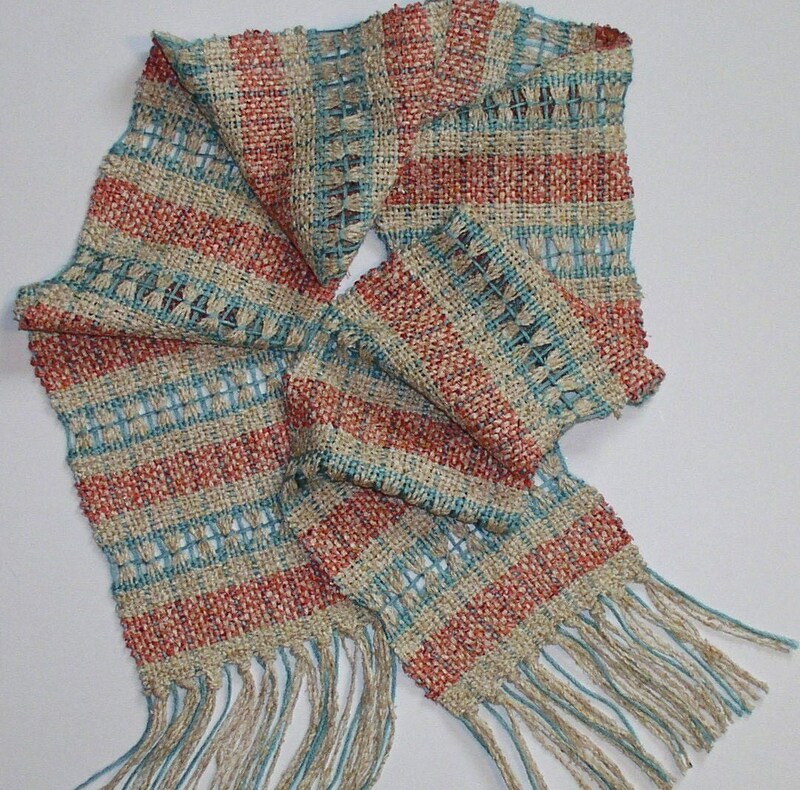 They are made of acrylic yarns and can be used either wet or dry. One thing I do to make cleaning more enjoyable is to sprinkle a few drops of essential oil on my dust rag. Somehow, the wonderful aroma makes cleaning more enjoyable. 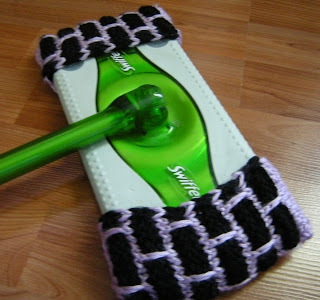 The same thing could be done on these knitted pads for sweeping the floors. For heavier cleaning, I have tried the Swiffer pads for wood floors, and they seem to make the floor really streaky. With these re-useable pads from Country Kiddies, I could just used my favorite vinegar and water solution that never streaks. Spring cleaning, here I come! Every month, team members are given a new theme and challenged to come up with a creative interpretation. 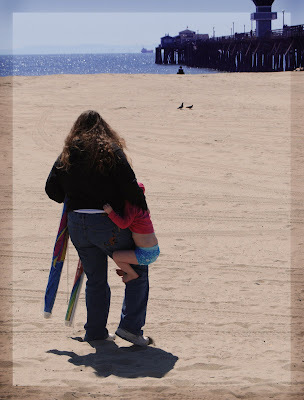 May's theme was "Beaches". Check out all the fabulous entries below, then scroll all the way to the bottom to vote for your favorite! The winner will recieve a two week advertising spot on our blog. Voting ends at midnight on June 12.